Whenever I go out for a run, I always need to sort out what I want to bring with me versus what I need to bring with me. (Kind of like packing for a vacation). Basics are keys, Oyster card, tissues, and my phone in case of minor or major emergencies. I am not the best with technology so if I can I bring my iPod with me too (one day I will learn how to put my iTunes music on my Android phone). Others might might to have water, gloves, gels, or a rain jacket. Runners will sympathise that once you have figured out what you bare bringing with you, then you have to sort out how you are going to carry it all without getting a cramp, chaffing, or loosing your form. 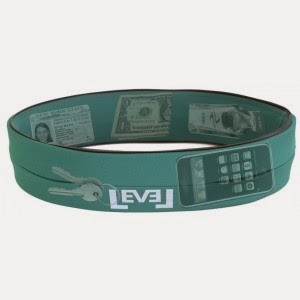 FlipBelt is a simple unobtrusive way to carry a few flat, light items with you. It is simply a tubular band that goes around your waist or hips. It has 4 slits that allow you to store items easily. The belt folds over (if items permit) or you can flip it to 'seal' the slits and prevent your stuff from leaving a trail behind you. There are 8 colors to choose from. The material is soft and slightly stretchy (a machine washable Spandex-Lycra blend), so it feels comfortable as soon as you put it on. When my phone, keys, and Oyster card are in it, I can't get the band to flip in half so I was conscious of whether or not anything was falling out of the slits. In retrospect, I could have turned the belt over so the slits were on the inside (against my body) and therefore less likely to let anything slip. Running with the FlipBelt was easy. I barely noticed that I was wearing anything at all. Nothing was bouncing or pressing into my skin. It didn't ride up from my hips during my runs either. This might be different if you are wearing slippery material, such as Lycra. Not only could I wear the Flip belt on runs, but any other time I didn't want to carry a wallet- hiking, skiing, traveling (note: a passport won't fit in the Flipbelt), or at the beach. It is a simple accessory but sometimes those are the most versatile. Lightweight and machine washable, it is easy to keep in your gym bag or suitcase for your next trip or race. If you are struggling on how to easily carry what you need on a run or while travelling, give FlipBelt a go! Flipbelt did not pay me for this review. They graciously sent me this product and all opinions are honest and my own. If you have a product you would like me to review, please contact me: mollie@ptmollie.com.